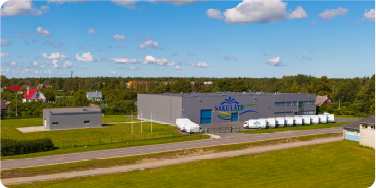 Founded in 1997, Saku Läte is the first company in Estonia, which started the production and bottling of high-quality drinking water in large bottles. Saku Läte water is produced in Saale, Saku parish, Estonia. In 2011, we opened a new production building in Saku. In 2013, we started to resell the natural mineral water of the subsidiary of Saku Läte, Venden SIA, in small bottles. In the same year, Saku Läte created its own brand of high-quality coffee beans. Our range includes four different coffee beans: Saku Läte Intense, Saku Läte Classic, Saku Läte Grand and Saku Läte Premium. In addition to the water coolers, Saku Läte also rents out Jura espresso machines. Saku Läte wishes to offer its customers the most convenient service where the customer would be able to order drinking water, water cooler, coffee machine, coffee and small bottles for home or office from one place. Fast, reliable and easy delivery. Saku Läte drinking water that cares. WHY CHOOSE SAKU LÄTE AS YOUR WATER AND COFFEE PARTNER? SAKU LÄTE drinking water is bottled in our modern production building in Saku to where we also arrange guided tours. SAKU LÄTE assigns a personal customer manager to each customer, advising and assisting you in various matters. Call or come visit us and get acquainted with your customer manager. The composition of SAKU LÄTE drinking water allows you to consume our drinking water without any restrictions. SAKU LÄTE product range includes CoolTouch water dispensers that have been developed by our group based on innovation and energy efficiency. SAKU LÄTE is available all over the Estonia. All you need is to make a phone call or an Internet order, and the water will be delivered to your office, store or home during the appropriate working day. In addition, the drinking water of Saku Läte is being resold by a number of distributors, and Uptrend Teenused in Saare County and Hiiu County. See our distributor map. The drinking water of SAKU LÄTE has received high recognition – since 2003, we been awarded the “Tunnustatud Eesti Maitse” title. We are also a member of the Estonian Chamber of Commerce and Industry. In November 2006, SAKU LÄTE concluded a “National operation stockpile resource contract” with the Ministry of Rural Affairs – we are partnering with the country when preparing for an emergency, and organising the water supply for the population in an emergency. SAKU LÄTE prefers natural and high-quality products in its product range. SAKU LÄTE offers its customers convenience: water and coffee solution from one place. SAKU LÄTE delivers you the goods directly to your home or office.